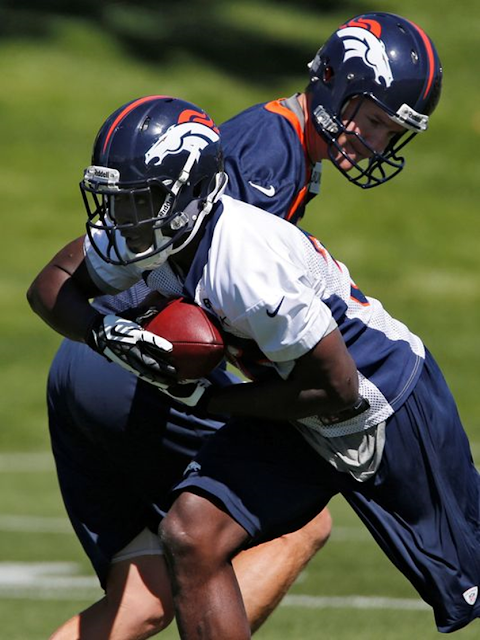 Denver Broncos quarterback Peyton Manning hands the football off to running back Montee Ball during offseason practices in Englewood, Colo., on Thursday, May 30, 2013. ENGLEWOOD, Colo. — Montee Ball isn't being allowed to ease into anything with the Denver Broncos. Ball, a second-round pick running back from Wisconsin, has spent time after most of the team's voluntary practices working through plays with quarterback Peyton Manning. Even on the team's nine-hole golf outing earlier this week, Ball found himself in Manning's foursome. "I can tell you Ball (and rookie tackle Vinston Painter) have been studying their playbooks and not playing much golf, which is a good thing," Manning joked Thursday. But Manning was clear about how much he, and the rest of the Broncos, is depending on Ball to be ready to play right away this season. "We're just kind of going through plays, going through games, getting him comfortable hearing audibles at the line of scrimmage. Because we are going to count on him in a big way this year," Manning said. "He's a rookie, but coach (John) Fox isn't going to bring him along slowly." Ball and 2012 third-round pick Ronnie Hillman seem to be the players benefiting most from veteran Willis McGahee's decision to not attend these voluntary practices. McGahee is continuing to recover from knee injury that ended his 2012 season in mid-November and is doing most his training and rehab in his hometown of Miami. Fellow veteran Knowshon Moreno has also not been cleared to participate in team drills because of the knee injury he suffered in Denver's playoff loss to the Baltimore Ravens in January. Manning said he has not spoken to McGahee lately, and is instead trying to focus on working with the players who are in Denver. Left tackle Ryan Clady, who has yet to sign his franchise tender, is the only other Broncos player not attending the voluntary workouts. Several other players are being held out because of injuries but are going through rehab at team headquarters. McGahee is scheduled to earn $2.5 million in 2013, and counts $3 million toward the team's salary cap. He is under contract through 2014. McGahee's agent has not returned a phone message from USA TODAY Sports. "The players that aren't here — there are individual and specific situations. Whether there is a business decision being made on Willis' part on his side or on the Broncos' side, that is kind of to be determined. I'll say this: Willis was a great help to me last year," Manning said. "When he got hurt last year, that was a blow to our team. We really kind of replaced him by committee. Knowshon and crew really did a good job of stepping up, but there's no question Willis was a big help to me last year and our team. But, like I said, we'll see how these next few weeks and how it plays out here." There are very few negotiable items with rookie contracts under the rookie wage scale implemented after the lockout in 2011. Each pick has a salary floor and ceiling based on draft position. All contracts are four years in length, except teams have an option for a fifth year with first round picks that must be exercised after the third year of the deal. Contracts are fully guaranteed at the top of the first round. The main issue with these contracts is whether the guarantees will have offsets. An offset clause allows a team to reduce the guaranteed money owed to a player when he is released by the amount of his new deal with another team. The player receives his salary from the team that released him in addition to the full salary from his new contract with another club when there isn’t an offset. Practically speaking, the offset issue will only come into play in the latter years of rookie deals if the player is a disappointment. Most teams with early first round picks are attempting to hold the line on offsets after eventually conceding the issue last year. None of the top eight picks signed contracts until the latter part of July when the start of training camp approached because of the offset stalemate. The first seven picks didn’t have offsets with their guarantees. The ninth and 14th picks also signed deals without offsets. Agents feel justified in insisting on guarantees without offsets because the current collective bargaining agreement drastically reduced salaries at the top of the draft. Eric Fisher’s fully guaranteed four-year deal will be worth $22,190,498, including a $14,518,544 signing bonus, while Sam Bradford signed a six-year contract worth a maximum of $86 million (with $50 million in guarantees) as 2010’s first pick. The rollback in rookie salaries ensures that teams can’t make the type of financial mistake the Raiders did by selecting JaMarcus Russell with the first pick in 2007. He made $39.365 million in three disappointing seasons in Oakland, which is slightly over $17 million more than the four-year deal Fisher is expected to sign. The new resistance stems from the Miami Dolphins signing Ryan Tannehill, the eight pick in 2012, to a contract containing offsets in each year. Instead of a deal without offsets, Tannehill received a better payment schedule on his signing bonus (first round picks usually have some portion of their signing bonus deferred) and minimum base salaries in 2013 through 2015, with the rest of his annual compensation in sixth day of training camp roster bonuses. 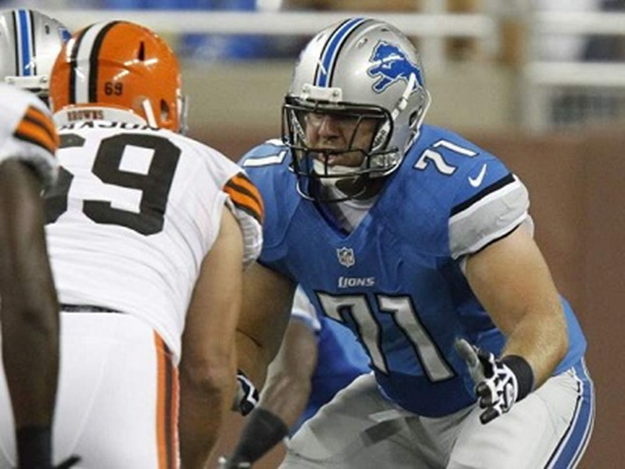 The Detroit Lions were the first team to sign a player taken early in the 2013 draft. Fifth pick Ziggy Ansah does not have offsets, which was expected, in his fully guaranteed four-year contract. The Lions’ 2012 first round pick, Riley Reiff (23rd overall), has the first three years of his deal guaranteed without offsets. He has the only contract in the second half of the first round without offset language. Surprisingly, the Lions’ second round pick, Darius Slay, doesn’t have offsets either, which is unprecedented. Teams scored a victory in the offset battle with 14th pick Star Lotulelei because his contract with the Carolina Panthers contains offsets. This is noteworthy since the St. Louis Rams didn’t include offsets in Michael Brockers’ deal last year as the 14th pick. Robert Quinn, 2011’s 14th pick, only has an offset in 2013, his third contract year, with his Rams deal. The Panthers had given their two previous first round picks under the rookie wage scale, Cam Newton (first pick in 2011) and Luke Kuechly (ninth pick in 2012) deals without offsets. The inclusion of offsets in Lotulelei’s deal shouldn’t impact Tavon Austin’s ability to get guarantees without offsets. Although Tannehill had them as the eighth pick last year, the Rams have established a team precedent on offsets with Brockers and Quinn later in the first round. If another team besides the Rams or Lions had the eighth pick, offsets would probably be a sticking point in the deal. A situation that bears watching is with third pick Dion Jordan. Generally, teams are reluctant to set unfavorable precedents in contract negotiations, which may make the Dolphins resolute about offsets. The Dolphins were successful in getting offset language with Tannehill despite being sandwiched by deals without it. Tannehill’s offsets are significant because quarterbacks are usually given favorable treatment in rookie contracts, particularly in the early rounds. For example, Andy Dalton and Colin Kaepernick received larger third year contract guarantees in their 2011 rookie deals as the third and fourth picks of the second round than the two players taken ahead of them in the second round. Additionally, all of the guarantees in the contracts signed during Miami’s free agency spending spree, includingMike Wallace’s five-year, $60 million deal, contain offsets. The Dolphins may also feel that they can be adamant because Jordan is expected to primarily contribute as a third down pass rusher and on special teams as a rookie. The Philadelphia Eagles and the Cleveland Browns, who have the fourth and sixth picks, may be equally determined to sign deals with offsets, despite Ansah’s deal, partially due to the potential dynamics with Jordan. The Eagles are sensitive to offsets because of Nnamdi Asomugha’s 2011 deal, which made him the NFL’s highest paid cornerback. $4 million of his 2013 base salary was fully guaranteed without an offset. He was released in March when he refused to a take a substantial pay cut. Asomugha will receive $4 million from the Eagles and $1.35 million from the one-year contract he subsequently signed with San Francisco 49ers this year because of the lack of an offset. Whenever a new regime takes over, contractual precedents can become obsolete or meaningless, especially if they aren’t consistent with the new regime’s philosophy. Browns CEO Joe Banner and general manager Michael Lombardi may refuse to be bound by Trent Richardson’s deal without offsets as the third pick last year. 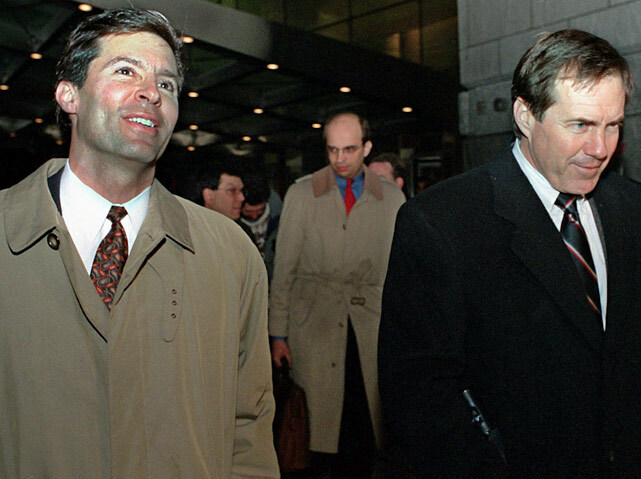 The Eagles were at the forefront of teams signing second round picks to five-year deals when Banner was team president. While Lombardi was a front office executive with the Oakland Raiders, second through seventh round picks routinely signed five-year deals. A four-year deal was considered as the norm in the second round, with three-year deals as the standard in the latter parts of the draft. These practices stopped when the 2006 collective bargaining agreement limited contracts after the first round to a maximum length of four years. Given the hard bargain driven on length of contract, the same approach could be taken with offsets. It seems unlikely that Fisher, the first overall pick, will sign a contract with the Kansas City Chiefs containing offsets. The first pick hasn’t had offsets since the rookie wage scale’s inception in 2011. The situation is compounded by Joel Segal representing both Fisher and Austin. If Austin’s deal doesn’t contain offsets as anticipated, the Chiefs will not only have to overcome the established practice with the first pick but will have a hard time justifying to Segal that his client taken seven picks higher (Fisher) than his other client (Austin) should have less favorable contract terms. The Jacksonville Jaguars shouldn’t fare any better with second pick Luke Joeckel. Ben Dogra, who is Joeckel’s agent, resisted offsets with Robert Griffin III as last year’s second pick. It will be a surprise if Dogra, one of the NFL’s most prominent agents, reverses course with Joeckel unless directed by him to do so. The New York Jets could have more success on offsets with the ninth pick than the Chiefs and the Jaguars at the top of the draft. Dee Milliner recently switched to Tannehill’s agents. The Jets will try to use the Tannehill deal to their advantage in the Milliner negotiations. It will be interesting to see how the offset issue unfolds in the coming weeks. There could be a domino effect that extends to a majority of the subsequent picks that didn’t have offsets last year if Miami is successful in preserving their precedent with Jordan before the other picks sign. Even though holdouts are largely a thing of the past because of the rookie wage scale, there could be an increase in them if agents are unwilling to give back the ground gained last year regarding offset clauses. Mike Vrabel could do it all. 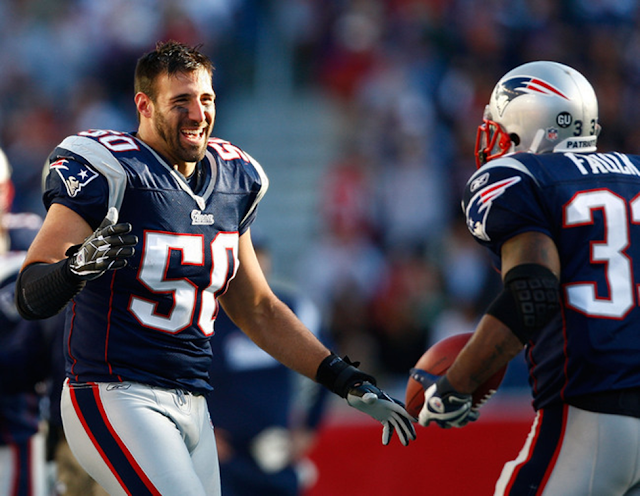 Whether it was terrorizing quarterbacks (12.5 sacks in 2007) or chasing down running backs, Vrabel did everything exceptionally well and was one of the best defenders on a very good defense. Heck, Vrabel could even play offense, evidenced by his eight receptions for eight touchdowns with the club. 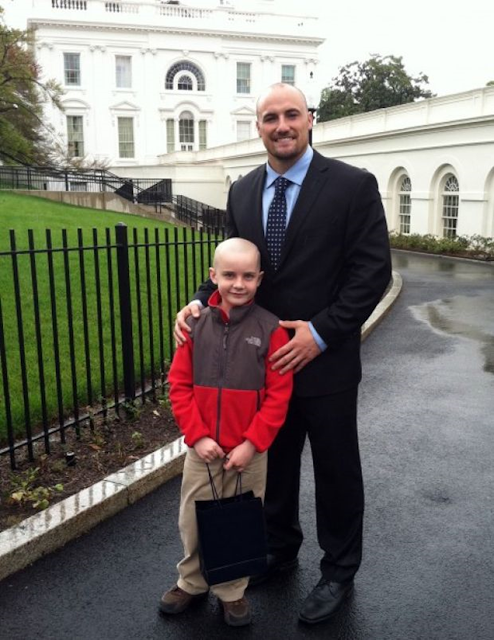 There are no guarantees for Rex Burkhead. He will have to fight like heck to make the Cincinnati Bengals' 53-man roster. He obviously made a nice first impression on coaches last weekend during rookie mini-camp. 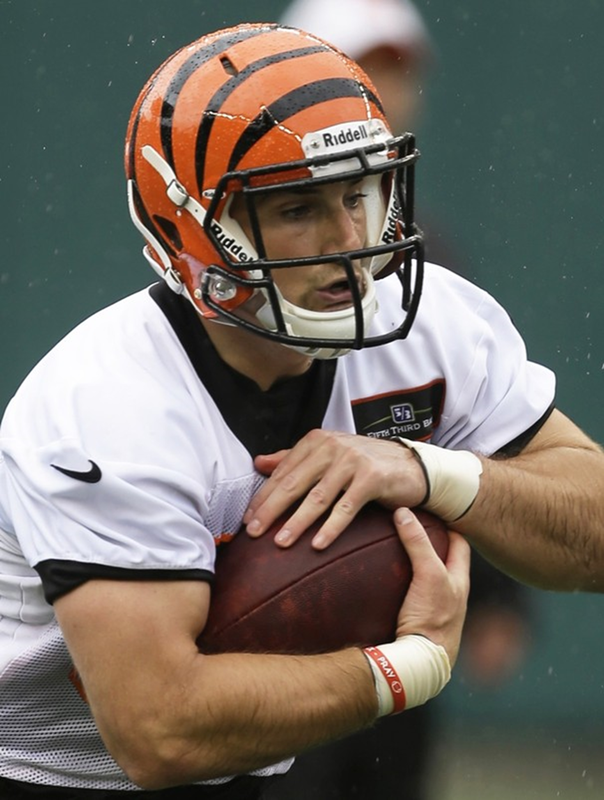 Consider the following quotes (from www.bengals.com) a supplement to the story on Burkhead we ran earlier this week. Said offensive coordinator Jay Gruden: "He's quicker than a cat. He has (one of the fastest times) in the short shuttle. His quickness is above average, if not great, but the intangibles he has, the size he has, his strength, his work ethic, all that makes him to be reckoned with come camp time. He's got great feet and quick; it's what we thought we had (with him). He's a great option for us. He’s a little bit thicker and bigger to handle pass protection. He's tough as nails, we know that." Said running backs coach Hue Jackson: "I was pleasantly surprised," seeing Rex up close and personal. "Not that I didn't know he had ability, but watching him in person, you get to see a guy in a whole different light. He has extremely quick feet, has really good hands, is very smart, and catches on extremely well. He’s just another good player for our room." Bill Belichick, Bob Stoops, Kirk Ferentz, Bo Pelini, Todd Graham and Bret Bielema would make an amazing coaching staff. They also make an impressive client list for Neil Cornrich, arguably the leading agent of football coaches, both professional and collegiate. He has deep connections throughout football and the trust of team decision-makers. Cornrich's also an attorney, which helped him secure a favorable $1.65 million settlement for fired Kansas State head coach Ron Prince. The Cleveland-based agent also represents several NFL general managers and a solid list of NFL players, including Marshal Yanda, Ted Ginn Jr., Riley Reiff and Montee Ball. Some of Cornrich's best work is detectable in less glamorous places, like in negotiating salaries for coordinators. He represents Colts offensive coordinator Pep Hamilton, whose salary exceeds that of some NFL head coaches. When you think of the Ravens’ best player last year, does guard Marshal Yanda jump to mind? According to Pro Football Focus, Yanda was far and away the Ravens’ best during their Super Bowl season. And, personally, I am a believer that Pro Football Focus (PFF) does some good work. PFF counted down its list of Top 101 players of 2012, starting with Minnesota kicker Blair Walsh and ending with Houston’s J.J. Watt. Yanda came in at No. 32, one spot behind Washington quarterback Robert Griffin III. Yanda had a pass blocking efficiency rating of 98.4, the best of all right guards in the league. It’s times like these that make me thankful the Ravens locked him up with a five-year deal in 2011. The Ravens’ next closest player was wide receiver Anquan Boldin at No. 63. Running back Ray Rice(No. 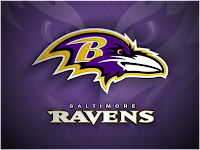 92) was next and quarterback Joe Flacco (No. 100) barely made the list. What do you all think of the rankings? CLEVELAND, Ohio – This will seem weird, but it's the way my mind works sometimes. When I look at Ted Ginn Sr., I think of Ted Kennedy. That was Kennedy's concession speech upon losing the presidential nomination to Jimmy Carter, the point being Kennedy wasn't conceding his life's purpose. Ginn has been to the brink and back this school year, having survived pancreatic cancer, and he sounded Monday like a guy who isn't conceding anything, much less his mission. With a clean bill of health, Ginn returned to work full-time April 25 as executive director at the all-boys public school he founded six years ago, Ginn Academy in Collinwood. He plans to be back on the sidelines as head football coach at Glenville this fall after missing all of last season. Three surgeries and a long hospital stay took a toll. He walks gingerly, but he's regaining his strength. He made it through a long track meet in Austintown on Saturday without any problems. He's lost more than 50 pounds. During his treatment and recovery, Ginn was urged to retire by those close to him, including his son, Carolina Panthers wide receiver Ted Ginn Jr. He wanted his father to kick back and enjoy life. Ginn, 57, will not hear of it. His cause endures and his work goes on. “This is my life. This is my calling. This is what I do. What am I going to retire to? This is what kept me alive,'' he said, emphasizing alive. Ginn firmly believes had it not been for his mission to “save lives” of his students, cancer would have claimed his. He said retiring from a life devoted to at-risk, inner-city kids would have been selfish. “I'd only be thinking about myself. If I didn't have purpose and love and understanding, then God wouldn't have kept me here,'' he said. Ginn always speaks more like a mentor and preacher than a coach, and he sounded more inspired than ever about his job and his students, which might explain the approach he's taking to the coming football season. Glenville missed the playoffs in 2011 and 2012, going 1-5 in nonleague games. This year, in the new seven-division playoff format, Glenville is expected to drop to Division II and presumably does not need a demanding nonleague schedule to make the playoffs. But the Tarblooders open 2013 with road games against Division I powers St. Edward, Solon and Cleveland Heights. Glenville's roster is stocked with its usual assortment of highly regarded college recruits. Glenville should be in the discussion for its first state championship, but you won't hear Ginn talking about it. When Ginn says compete, he's never talking about wins and losses, let alone state glory. “I'm not going to wake up every morning and say, 'I'm going to win a state tile,''' he said. “I don't care we didn't make the playoffs. We had a great season. I engaged the kids. Ginn said his academy graduates about 95 percent of its students, which this year includes 62 seniors. Sports, he said, skew some people's perspective of his mission. “This is Glenville football; this is what Glenville football is about: You can look at the scoreboard all you want, and you never get the answer,'' he said. In 2008, stricken with cancer that eventually would take Kennedy's life, the Senator addressed another Democratic convention and put a different spin on his famous 1980 speech, ending with a line that makes me think of Ginn even more today. 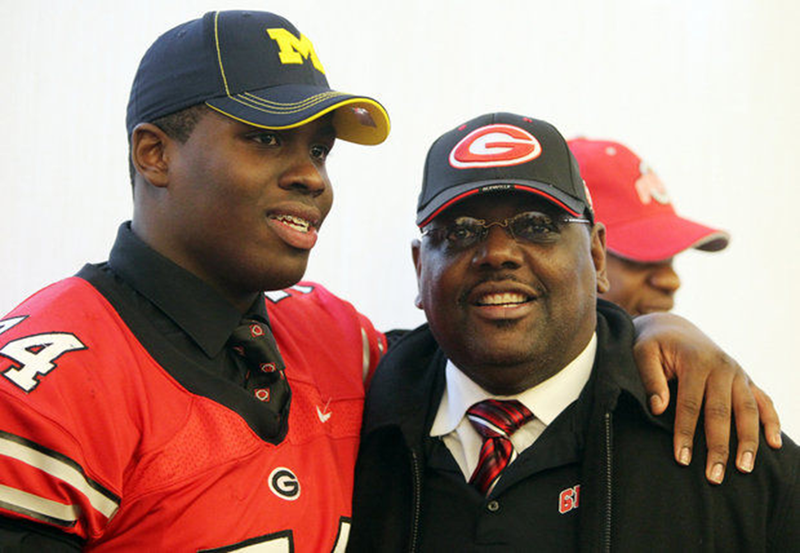 Labels: NC Sports Coaches in the News, ted ginn sr.